Space travel to Mars. Robot zoo. Nano-Sumo. 3D printers. Dissected squids. The Bay Area Science Festival, held this year in San Francisco this weekend, attracts more than 30,000 visitors each year, with parents and kids of all ages who are treated to over 150 interactive experiments and demonstrations ranging from chemical structures seen through a microscope to experiencing space travel. 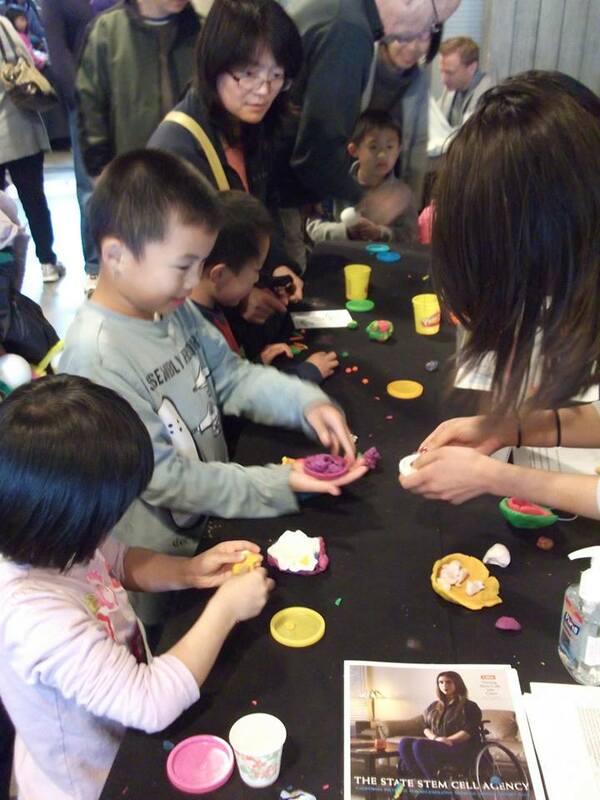 A bunch of stem cells took part in the fun in the form of Play Doh! Members of the Cal SSSCR (Student Society for Stem Cell Research) joined hands with CIRM to showcase how the stem cell agency is promoting stem cell research. Along with fellow UC Berkeley students I had the opportunity to be a part of this wonderful experience. For high school students we not only created the interest in science, but also gave them an insight on how this field brings together various other areas: engineering, physics, economics, policy and law to name a few. We wanted to show them that the work done until now was not just direct biology research, but a combined effort and collaboration between different fields that came together to produce these results. The goal was to instill them with the curiosity to learn more and create awareness early on and help them foster an understanding of how their particular interests, whether it be arts, computer science, or biology…they can still contribute to the progress of science. Furthermore, we also had the opportunity to provide material and information for high school teachers who were eager to find resources about stem cell science to add to their curriculum. Their enthusiasm was in a way a great relief. Reflecting back, when I ‘briefly’ learned about stem cells just a few years ago in high school AP Biology, I believe we have made major strides in clarifying the process and debunking the myths about this field. While the kids were being inspired… we had a chance to converse with the parents. To inform them of how we have been using the taxpayers money…their money! Everyone person learns in different ways – some need visuals, others want numbers. CIRM I believe has successfully managed to cater to those needs – research articles, public events, blogs, YouTube videos, up to date statistics on grants given to specific disease areas, and current standings on clinical trials. CIRM showed that they took great responsibility in carefully spending every penny. With research in over 40 diseases, and numerous human clinical trials in progress, the agency has successfully upheld the trust put forth by the people who voted for them. SSSCR (Student Society for Stem Cell Research) founded by Marion “Joe” Riggs in 2003 is as a student advocacy group that supports stem cell research. At Cal, SSSCR spawned a program called SCEOP: Stem Cell Education and Outreach Program, which equips Cal students with the knowledge and tools necessary to give educational presentations at local high schools on basic stem cell science, ethics, and policy. The science festival simply expanded our teachings to a grander stage, attracting a broader range of audience. UC Berkeley, Molecular & Cell Biology B.A. Thank you Sai for shedding light on Cal SSSCR’s collaboration with CIRM and thank you Dr. Knoepfler for dedicating a post to this collaboration!